A new video from the group calling itself "Organic Spies" is once again rocking the organic food industry. 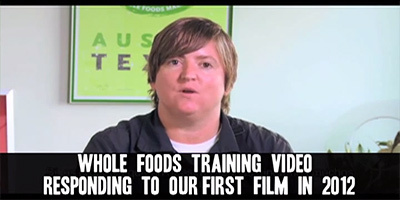 In the video, a woman who identifies herself as a former employee of Whole Foods Market (WFM) testifies that she and other employees were deliberately trained by Whole Foods Market management to lie to store customers about whether the stores carry foods made with genetically engineered ingredients (GMOs). When we first started, we had a "Day One and a Day Two, and they teach us about the core values of Whole Foods Market, the core values of nothing's artificial, everything's natural... When I first started at Whole Foods, I didn't know what a GMO was. I had no idea what it was. They taught us what it was, and how Whole Foods Market did not carry GMOs. So if a customer would have came up to me and said, do you guys have anything with GMOs? Does this product contain GMOs? [I would have said] absolutely not. Does not contain GMOs. Because we were taught that we don't carry anything with GMOs, only natural, nothing artificial. According to Organic Spies, Whole Foods Market deliberately taught employees to lie to customers about GMOs for a five-year period, spanning 2007 - 2011. The Organic Spies group claims to have evidence of this from multiple Whole Foods Market stores in several major cities across the United States. Organic Spies further claims that Whole Foods top executives were fully aware that low-level employees were being deliberately trained to lie to customers about GMOs. This claim is denied by Whole Foods Market (see below). As part of the due diligence conducted by Natural News, I personally saw documents that appear to confirm this whistleblower was a former employee of Whole Foods. I also spoke with her by phone and was able to confirm that she speaks with what appears to be specialized knowledge that would not normally be known by someone who had not been an actual employee of Whole Foods. I was shocked to find out that Whole Foods did carry products containing GMOs. I feel like a fool, you know, if a pregnant woman came up to me, or somebody with serious medical issues asked me that, I would tell them no, we do not carry anything with GMOs... firmly believing that we didn't carry anything with GMOs. In my training, the ASTL did Day One, Day Two. They're like the second person in charge of the store. And on top of them is the store team leader, who's in charge of the whole store. I believe that whoever was teaching the class, the ASTL, also believed that there was no GMOs in the store, and everybody who worked in the store, I really believe thought that there was no GMOs. Who's telling the ASTLs that train us that there are no GMOs? When Organic Spies came out and they had on film team members saying we don't carry GMOs, I know they whole-heartedly believed that Whole Foods didn't carry GMOs. That's what we were taught. They didn't carry GMOs. So when the Organic Spies came out, I called my friends who used to work at Whole Foods. I said, did you know that Whole Foods carried GMOs? No! They do? Yeah! They do! 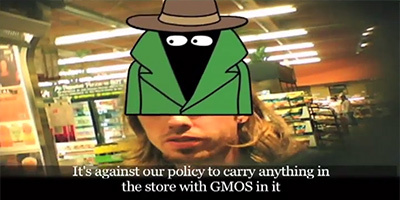 This new video is the second major release from the group calling itself "Organic Spies," which made headlines last year by catching dozens Whole Foods employees on video giving out false and misleading information about GMOs sold in their stores. The first Organic Spies video, available here on TV.naturalnews.com, received hundreds of thousands of views on YouTube before it was suddenly censored by YouTube, most likely under pressure from Whole Foods Market. It featured over a dozen Whole Foods employees lying to customers and stating that Whole Foods did not carry or sell any genetically modified foods. 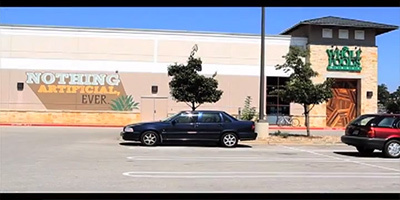 As a statement of fact, Whole Foods carries all sorts of foods containing GMOs, and after this Organic Spies video hit the 'net, Whole Foods was forced into a public relations position where they needed to issue a public denial, claiming they did not intentionally train their employees that the stores do not carry GMOs. Whole Foods carries so many different GMOs that they don't even know how many GMO products they carry. As stated by a Whole Foods employee in a public relations video, "Does Whole Foods Market have GMOs in our stores? Yes, we probably do have lots and lots of products that contain GMO ingredients in our stores. How many? We don't know... and neither does any other grocer in the United States." 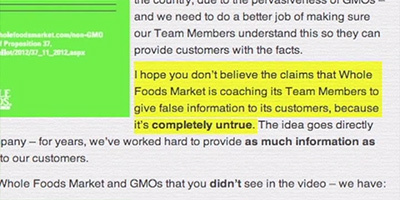 In a September 27, 2012 blog post, Whole Foods CEO A.C. Gallo stated, "I hope you don't believe the claims that Whole Foods Market is coaching its Team Members to give false information to its customers, because it's completely untrue. The idea goes directly against who we are as a company -- for years, we've worked hard to provide as much information as possible about our products to our customers." This statement is now directly contradicted by the new Organic Spies video being released exclusively here at Natural News. If the whistleblower is correct, it means A.C. Gallo was either deliberately lying to the public or was inexplicably unaware of the corporate training being given to new employees ("team members"). Click here to watch the video now and decide for yourself. Whole Foods now stands accused of functioning as an "organic fraud machine"
• Whole Foods has been granted "certified organic grocer" certification by CCOF, an organic foods certifier. It proudly promotes the "USDA Organic" seal next to its name, causing customers to falsely believe everything in the store is certified organic. • In blogs such as this one, Whole Foods refers to itself as a "Certified Organic Grocer," further causing customers to falsely believe the store is 100% certified organic. • In reality, Whole Foods Market sells thousands of products which are not certified organic at all. Many of Whole Foods' products are grown with pesticides, herbicides and genetically engineered seeds from Monsanto. This is not a conspiracy theory. It is openly admitted by Whole Foods employees and executives. • This deception is further reinforced by Whole Foods stores posting very large signage on the side of its buildings that say things such as, "Nothing Artificial. Ever." (See image, right). To understand why this claim is blatantly false, realize that genetically engineered foods are, by definition, artificial. • Whole Foods' claim that it is a "Certified Organic Grocer" is extremely misleading to consumers who are tricked into thinking that everything the store sells is organic (and therefore also non-GMO). • The CCOF certification of Whole Foods is an abuse CCOF's certification power and causes industry-wide harm because it dilutes the true meaning of organic certification. If a store that isn't 100% organic can be "certified organic" by CCOF, then what exactly does "organic" really mean? Can the corner quickie-mart also be certified organic if it carries a few organic items among the Slim Jims and Cheetos it sells? For these reasons (and more), Organic Spies calls Whole Foods the "organic fraud machine" and demands that its deceptions be stopped. See more evidence in this video, exclusively at TV.NaturalNews.com. As you can see from this image on the right, Whole Foods proudly proclaims that it is "America's First National Certified Organic Grocer. 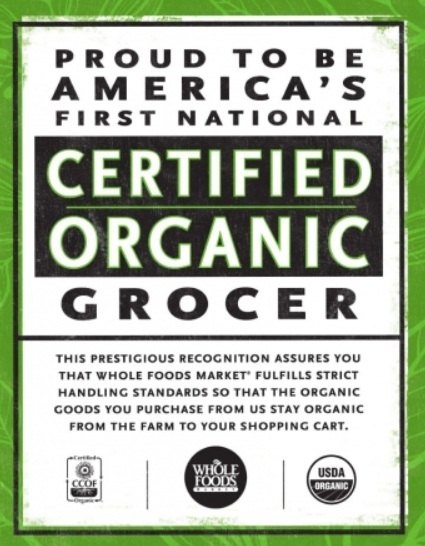 This prestigious recognition assures you that Whole Foods Market fulfills strict handling standards so that the organic goods you purchase from us stay organic from the farm to your shopping cart. Hold on a sec, folks. Did you really read that? This CCOF organic certification appears to be certifying nothing more than the claim that "organic foods STAY organic." Is that really so amazing? So really, if you dig into the Whole Foods organic certification granted by CCOF, it seems that Whole Foods is really only being certified in its food handling. There is absolutely nothing in the certification that says Whole Foods sells only organic foods, which would be the commonsense requirement to be a "certified organic grocer." According to the USDA, in fact, a food cannot be "certified organic" unless it contains at least 95% certified organic ingredients. Does the Whole Foods inventory consist of 95% certified organic products? Not even close. As an independent investigative journalist, I have to agree with Organic Spies that Whole Foods Market is engaged in quite a number of alarming marketing deceptions. The "organic fraud machine" accusation has merit and needs to be further investigated by the USDA as well as independent media like Natural News. Why? Because the CCOF organic certification of Whole Foods appears to lack any legitimate factual justification. The idea that a grocer can "handle foods" in a specific way is simply not sufficient to achieve "organic certification" for the entire store. The very idea is ridiculous, in fact. 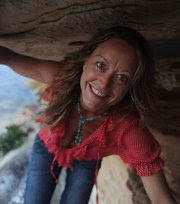 By the way, as background to all this, it is important to tell you that I am the director of a USDA certified organic food manufacturing facility, and I have been through the organic certification process. I am not simply throwing out wild guesses at what organics really means. I am reporting this with the benefit of considerable first-hand experience, and I can tell you with confidence that many consumers will be misled by Whole Foods' claim to be a "certified organic grocer." Many people will assume that means the entire store is all organic (which it isn't). Want to hear some honest language from a truly certified organic grocer? Check out this web page from Natural Grocers. As Natural Grocery explains, "One of the founding principles of Natural Grocers by Vitamin Cottage is a commitment to quality. It is within this commitment that we sell only USDA certified organic produce -- you will never find conventional produce at any of our stores." Simple, huh? So why can't Whole Foods be just as clear about what it sells? 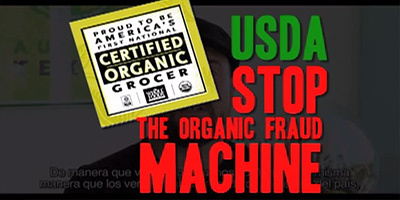 Organic Spies calls for USDA to intervene and stop the "organic fraud machine"
In this new video, the Organic Spies group is calling for the USDA to intervene and "stop the organic fraud machine." According to Organic Spies, Whole Foods has deliberately trained its employees to lie to the public about the ingredients in the foods it sells, and it has furthermore engaged in a highly deceptive campaign of what Organic Spies characterizes as "fraud" by tricking consumers into believing everything it sells is organic (via the CCOF "certified organic grocer" status). Organic Spies does not have a website. If you attempt to post this video on YouTube, it will be immediately banned due to YouTube's outrageous censorship of real journalism and whistleblowers. Thus, if you do post this video on YouTube and share the link, people who try to click the link will end up seeing a "video removed" message from YouTube. To avoid this, only share this link from TV.naturalnews.com, which will be fully protected by Natural News according to the First Amendment of the United States of America, as well as all the protections of free speech accorded journalists and media organizations operating in the public interest. Natural News fully anticipates being threatened by the Whole Foods Market legal team, and we are well aware of our free speech rights as well as our responsibilities to protect our sources and conduct meaningful investigative journalism in the public interest. In fact, we would argue that we are one of the very few organizations left in America still conducting actual investigative journalism. As such, we are willing to go to great lengths to defend our First Amendment rights. You can support our mission to bring you stories like this by sharing this story.